There are certain TV shows that weren't even on my radar until Joel McHale started poking fun at them on his E! clip show, The Soup. Among them is The Wendy Williams Show. So it put a smile on my face to see that McHale paid Wendy Williams a visit on her show. Check out the video ahead! McHale's been poking fun of Wendy Williams for years. From her icky "gum wall" to the way she likes to use a lighter to cook her Slim Jims (for the "crackle"), McHale has found numerous amusing bits to showcase on The Soup. Demonstrating her good sense of humor, Williams had McHale on her show. See how he did when stepping away from the comfort of his studio and onto her territory. The Wendy Williams Show is like the Eiffel tower! What we don't see in the video above is that Williams actually opened the segment by showing a clip of McHale on The Soup making fun of her. And then the two hugged, and did a little unrehearsed dancing… kind of (she had to reposition him to sit on the correct side of the couch). And then, the above. McHale managed to inch around the word "criticizing" by saying he's celebrating shows like hers. Williams turns the tables on McHale by talking about his show, Community on NBC. The two have a brief conversation in which they discuss Chevy Chase's recent (well publicized) spat with the NBC comedy's series creator. From what McHale is saying, despite the issues, it sounds like he thinks Chase will return, assuming NBC renews the series for Season 3. Let's hope both turn out to be the case! That belongs on the set of The Soup, I think. Do they chew gum over there? 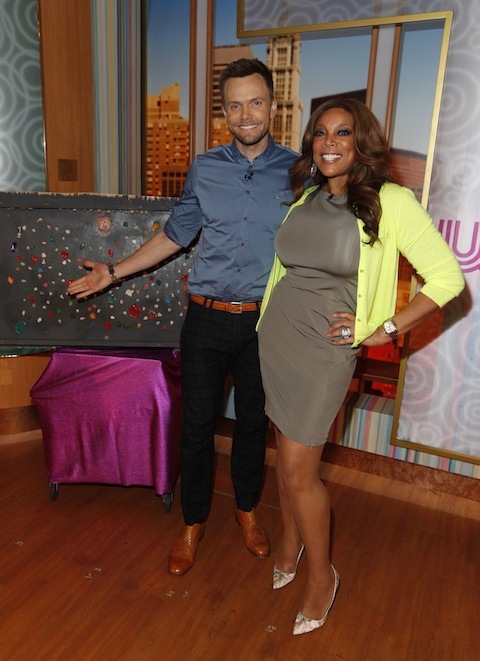 Check your local listings to see when and where The Wendy Williams Show airs near you!